Congratulations Dexter and Eldon! You have each won a $50 Gift Card to Elephant & Castle! Please email me at foodjunkiechronicles@gmail.com with your first and last name and your address so I can mail you the gift card :) I hope you will enjoy your time at Elephant & Castle! Remember you can use your gift card at both 212 King St. W. and 378 Yonge St. locations. I also want to say a big THANKS to the 70 contestants who participated in the contest. 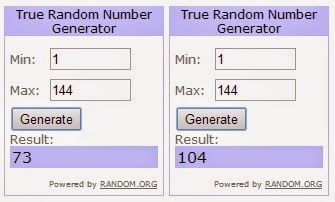 I used "True Random Number Generator" from random.org to pick the two winners for me.